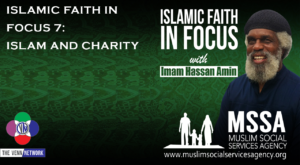 On this week’s Islamic Faith in Focus podcast with Imam Hassan he talks about Islam and Charity, or sadaqah as Muslims call it. Sadaqah, or giving of alms, is one of the five pillars of Islam. But, there are different kind of charity in Islam. The hadith of the Prophet Mohammed (pbuh) says that “Every act of goodness is charity” (Sahih Muslim), of course there is giving to the poor “To give something to a poor man brings one reward, while giving the same to a needy relation brings two: one for charity and the other for respecting the family ties.” (Al-Tirmidhi), but even something as simple as a smile is can be charity “Your smile for your brother is a charity. Your removal of stones, thorns or bones from the paths of people is a charity. Your guidance of a person who is lost is a charity.” (Bukhari). To stress the importance of charity the Prophet stated that “The believer’s shade on the Day of Resurrection will be his charity” (Al-Tirmidhi). Some charity even outlives the life of the man or woman. If they donate to a school, or give books, and so on…that sadaqah will continue to bless the man that gave it.